Back-Up Story: "The Origin of Lex Luthor"
Batman happens upon Trickster and Piper, left out on a ledge hung by ivy. Flash appears and takes them away. Batman scoffs. John Henry Irons tries to help Jimmy determine what caused his powers. The machine goes haywire when Jimmy develops a large cranium, and they get no answers. Flash confronts the villains in front of Bart's grave. They deny culpability, so Flash begins beating them to death. The "Queen" turns Atom back into a human, Jason escapes, and the Queen is pushed into another universe, seemingly dragging Donna with her. Holly and Harley (I think) survive the Amazonian battle, and are thus offered the gift of going to Paradise Island. A Witchboy resembling Eclipso talks with Mary Marvel for four pages before attempting to ensnare her. Karate Kid is told to go see Buddy Blank by Orr, and that his virus is imitating the OMAC program. Orr tells Desaad that he's done what he asked. The origin of Lex Luthor. Main Story - 1: Talk talk talk talk talk talk talk talk talk. Random action that holds no consequence. Moment of perplexity inspired by bad writing. Cliffhanger that fails in hanging or tension. Ivy and Deathstroke just let the villains leave for a... plot? Involving Batman? Whereby Batman will just happen to be on one weird roof in the middle of nowhere? And this plan fails, foiled by Flash, and no "Oh drat!" from the villains, who just assume everything went to plan? The entire cliffhanger for 36, thereby negated and as ridiculous as it seemed. Batman, out of character, scoffs and laughs as Wally takes them off to potentially kill them. Also talking very boldly and in the open for a guy trying to hide his identity. Batman used to talk less, act more, in that the idea is when he's in public, he's trying to accomplish a mission and hide his identity. He's now Adam West. Read this comic in Adam West's voice in your head. It works. Piper and Trickster call Flash 'Wally' even though he's wearing a mask and they have no idea who it is. Jimmy is running late on his Duela Dent article. Except this is supposed to be happening in real-time, and that was months ago. Except he's a photographer, and doesn't write articles, so any work he'd have to do would have been done at the scene. And hey, let's have ANOTHER scene where Jimmy tries to figure out his powers or that he has powers when he's already figured out his powers and knows he has them. Because it's not boring any more. You know what that means? It means next issue it's time for another New God death. Heh. The Queen has the power to enslave people, and turn them into bugs. She turns the Atom back just to show that she can (uh, yeah, there goes that cliffhanger), and she leaves Donna and Jason in an easily escapable trap. Rather than attack them when they do escape, or send her Monitor to attack them, or take over their minds, she clumsily runs and is tripped into another dimension. Is this Smallville? I feel like I'm writing a Smallville review. That's what happens when you apply the television mentality to a literary endeavor. Comics are literature, bite me. They should be treated with respect, not like this. Three pages of Marvel chatting with what will obviously be either Eclipso or another wasted character space with no compelling lead or tension or conflict. She's still trying to figure out her powers, twenty issues later. Buddy Blank and Orr, yawn. What the hell would Desaad want to do with a two-bit bounty hunter and his ridiculously trite henchman? Will it be revealed? GASP! I'm not into this any more than when I started. Awful, awful crap. Main Art - 3: Saiz does a decent job, but a lot of the faces are marred. Holly looking up (if that's Holly, as I assume, which speaks to the art) is marred and weird. It's not clear that the villains have been removed by Flash in the opening. On the bottom of page four, Jimmy looks like an old man. He really does. The story is conveyed, but the art is sloppy. I usually like Saiz. I'm not sure if it's the inks, or what, but there were issues here. Still, the Source Wall page was well done, and there were a few great moments. Back-up Story - 1: No no no no no no no no no no no no no no no. I can't fault Mr. Beatty. This is probably the story he was given. For two pages, he writes it well. The 1 rating is very explicitly for ruining the single most compelling character in the DCU and now making it official. As many of you know, my longtime dream is to write a Luthor ongoing. I find great compelling complexity in a guy who grew up poor, came into wealth out of murder and desperation, lost the love of his life to Superman, and the ensuing greed and revenge that came out of that. Instead, he's now a whining rich boy who hates Superman for being the biggest, smartest kid on the block. There's no rationale. He's just a jerk. New Earth even changes the new origin of Lex. Now he didn't hire an actor. He didn't lose his hair in an accident, it just fell out (see the panels). He's just a vengeful d#$% who wants to be regarded higher than Superman. DC is standing on a fine line with me right now. A VERY #%#$^@# fine line. You are about to potentially lose a fan of fifteen years of solid purchases. I mean, what did I love about DC? Interconnected books with a focal purpose I could identify with, instead of events for the sake of events lacking character. Superman as a literary endeavor with a linear progression. Lex Luthor as a complex villain. Lois Lane as an identifiable feminist figure and strong woman. Batman as evolving through disasters instead of one-shot crap. (No Man's Land, Murderer, and OMAC = good. The Island of Mystery, Gordon and Bullock back for no reason despite good reasons for being gone = crap). Wonder Woman as an identifiable character. Honestly, all that's left right now is Final Crisis. 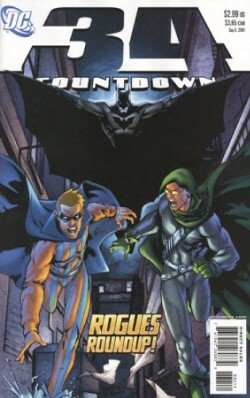 I was reading roughly fifteen to twenty DC books a month two years ago and ENJOYING IT. I am now reading six, and it's hit and miss on the Superman books. WE DEMAND CONTINUITY THAT MAKES SENSE. WE DEMAND BOOKS ON TIME. DiDio says we don't have to buy the books if we don't like them. Fine. Keep this crap up. We won't. For the last three months, I have been going to the comic store finding two to three comics I want to buy. Two years ago, that was nearly ten every week. I have sat through VERY LONG dry spells. You take my literary Luthor and replace him with a petulant idiot? You expect me to just stay tuned? Back-up Art - 5: Despite the utter blasphemy it conveys, still a solid effort. Great coloring, laudable character study. Good work. Cover Art - 3: Words on the cover, crappy words. Decent image, but nothing incredible compelling. Average. It doesn't help that I have no identity or care for the subject matter depicted. Didn't happen in the issue. Meh.